Saint William Catholic Church - Stained Glass Inc. In the Texas Hill Country, along the I-35 corridor, lies Round Rock, Texas. The city of Austin lies only a few miles away. Like the area, the local Catholic church of Saint William has grown quickly to serve the spiritual needs of the community. As part of the growth St. William Catholic Church had created a chapel. 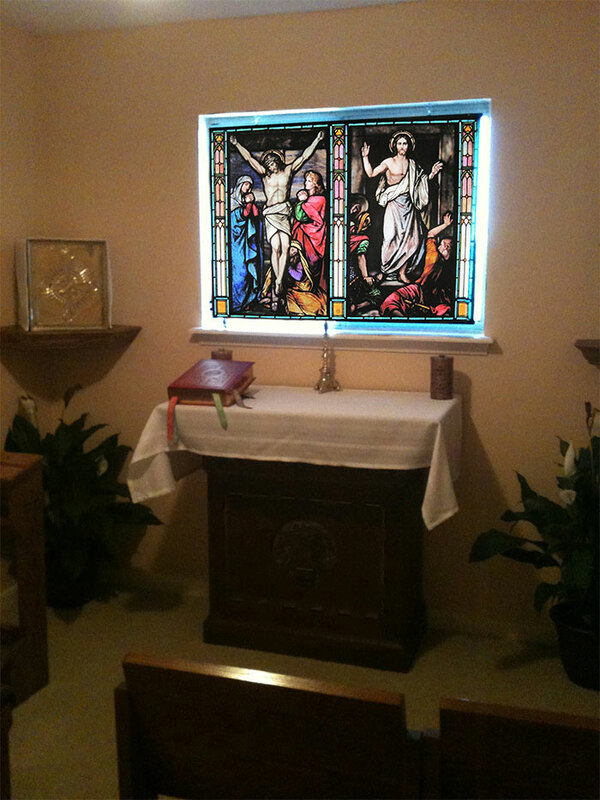 The church ordered custom sized window inserts of two of Stained Glass Inc.'s most beloved stained glass designs, a stained glass panel featuring the Crucifixion and one showing the Resurrection. The two panels were placed over a window behind the small altar in the chapel. To ensure the panel design was to the client's satisfaction, Stained Glass Inc. provided drawings and full color "proofs" of the windows for review and comment. This ensures the client is informed and satisfied with the design before it goes to production. Once approved, the fabrication and delivery took just two weeks and the result was spectacular. The window looks beautiful! We are very happy with it!